It emerged last night that a man from Scotland, who had been asked his opinion on every matter known within Oceania for the last 3 years, had been stripped of his right to voice an opinion in a private conversation because a journalist had recorded it. 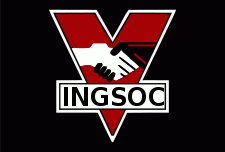 The ruling from the Ministry of Truth explained that the right to have a private opinion was automatically lost should a telescreen truth crew manage to record it. The incident happened following a brief conversation between Mr Gordon Brown and Mrs Gillian Duffy, a life long Ingsoc supporting prole from Rochdale in the North West of Airstrip One. Mrs Duffy is an economic and geopolitical expert with an hours-long plusgood reputation within the Ministry of Truth. She commented to Mr Brown that she felt the stabilisation of the Oceania’s economy and the inward migration of workers from outside her road may both have been doubleplusungood and made her feel disappointed to be a supporter of Ingsoc. Afterwards Mr Brown commented that the Ministry of Love had not properly vetted her before his conversation and that the prole held un-revisioned views. Mr Brown’s duckspeak was brought to the attention of Mrs Duffy in a spirit of plusgood openness without any self promotion or bias by Ministry of Truth operatives. Preparations for tonight’s telescreen debate between the Inner Party leaders have been complicated by Gordon Brown’s insistence that all participants must be naked so all microphones are clearly visible. In addition the taps must be left running in all toilets that he visits and the radios must be turned up as loud as possible in all meeting areas where Mr Brown is relaxing with his medication. The loss of the right of Mr Brown to hold a private opinion is not expected to have any impact on the behaviour of the Scottish ruling elite that have been in control of Airstrip One since the last free election in 1984. Yes, she is "allowed" her public opinion of immigrants, but he isn't "allowed" his private opinion of her.